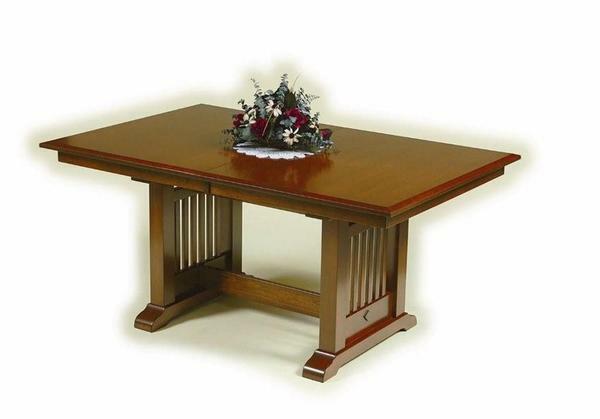 This Amish Mission Dining Table is a design modeled after the Mission furniture from the 19th century. Mission furniture is know for its emphasis on straight horizontal and vertical lines, along with large flat panels that highlight the beauty of the solid wood grain. Oak and quarter sawn white oak wood are the most popular types of wood used in this style of furniture. This Mission Table features bold vertical panels from table top to base, and a vertical cross-bar for additional stability. Call today to speak to an Amish furniture specialist at 1-866-272-6773 or visit our store to get an order started for your new dining room furniture. Shown with Concord Top and 1" Beveled Edge. Mission Table is shown in Quarter Sawn White Oak Wood with Michael's Stain. The Mission Chair is product id 2767 the Amish Mission Dining Chair. Hi Valerie, Gary delivered our table this afternoon. It is gorgeous!!! The style is great and the color is perfect. Please let Gwen know that we are very pleased with the table! Thank you!! The dining room furniture is Awesome! When they brought the hutch base in and we saw the wood and craftsmanship, we were awestruck! We couldn't be more pleased!